prohibitive cost of a network upgrade. 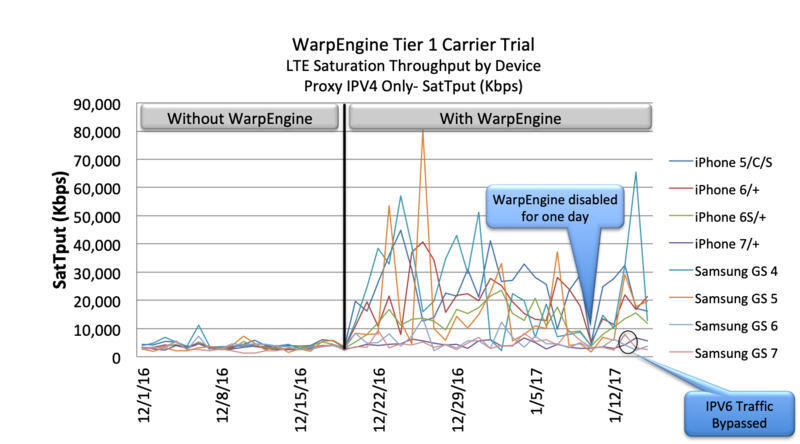 WarpEngine CT is a single ended solution with built-in GTP support that can be deployed at cell tower base stations to optimize uploads and downloads for smartphones and other mobile devices associated with them. No changes to the GTP network configuration are required, and all WarpEngine CT appliances can be controlled from a single WarpManager™ admin console. Mobile Operator’s LTE RAN network to improve end-user quality of experience. Mobile Operator’s LTE core network to improve throughput for Mobile Last Mile. LTE DAS (Distributed Antenna System) deployments to improve effective coverage area and throughput. Mobile LTE cell sites such as RDUs (Rapid Deployment Units) and COWs (Cell on Wheels) to handle high-traffic scenarios. Discover the benefits that WarpEngine™ CT delivers with a free hands-on demo. It is fast, risk free, and easy to test.